This is a listing for a 1 inch pin button badge. Its white with pink text which reads. 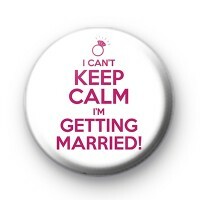 I can't Keep Calm, I'm Getting Married. Its for all the Brides To Be who are stressed and in panic mode. This is the perfect handmade wedding keepsake.